The other week I shared some things I'm currently enjoying on Netflix because it's just too hot to spend extended amounts of time outside. Today I thought it'd be fun to share some current movie reviews, because even though its hot outside sometimes you just need to get out of the house. Before I share my reviews I want to give a quick note about the movie theater we visit here in Dallas, Alamo Drafthouse (the Lake Highlands location specifically). Y'all this is hands down the best movie theater I've ever been to. It's clean and affordable, evening tickets are $12 and they're less expensive before 6pm and only $5 on Tuesday! You purchase your tickets online and select your seats and proceed directly to your seat when you arrive, no need to wait in a line to pick up tickets. Once you're seated someone will come around to ensure you're in your correct seat and to take your initial order, they'll even pre-run your card so you just have to sign your check at the end. 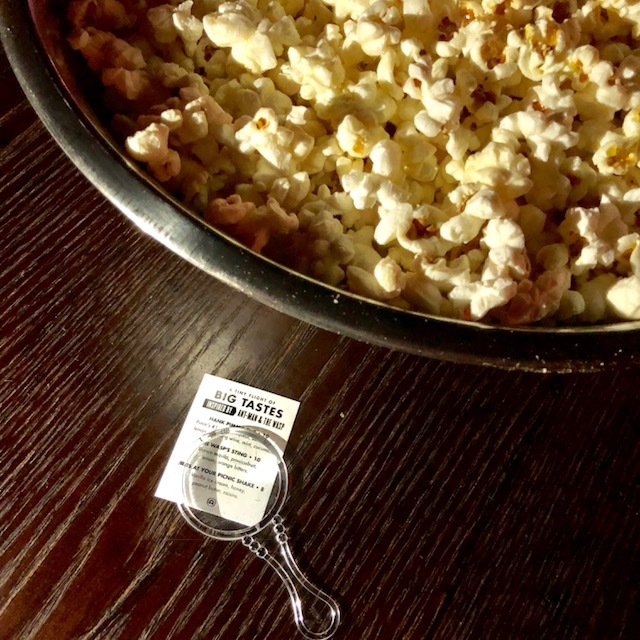 We usually get the bottomless popcorn ($7) and sodas ($4.5) and when we want refills all we have to do is fill out a little card and stick it up on your table for a waiter to come around. The seats recline and are very comfortable and roomy. We went to a different location and had issues with the group behind us so I filled out the email survey. A few days later I received an apology email from management and two complimentary tickets. Talk about great customer service! Okay and now onto my current movies reviews! Ant sized menu for Ant Man and the Wasp! What current movie have you seen and loved? I'm anxiously awaiting Mamma Mia 2 later this month, anyone else! ?